Objective: The objective of the game is to bounce quarters into a shot glass in order to make the other players drink. Supplies: A quarter for each player, a shot glass and alcohol of choice. Directions: The shot glass is set on the middle of the table. Each player has a quarter. When everyone is ready, someone says, "Kaplanga." Then, everyone tries to bounce their quarters into the shot glass. The game continues until there are two people who have not yet made the quarter in the shot glass (or one person, if there are only two or three playing). Someone then spins a quarter on the table. The people/person who lost the game must drink until the quarter stops spinning. 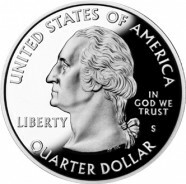 Other players may flick the quarter to keep it spinning. A player must take three drinks if they flick the quarter off the table or stop the coin from spinning.